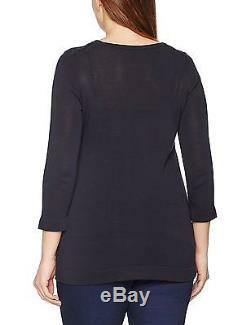 Persona by Marina Rinaldi Women's Allegro Long Sleeve Top. Knitted 100% Viscose, 62% Acrylic Details, 38% Polyamide. 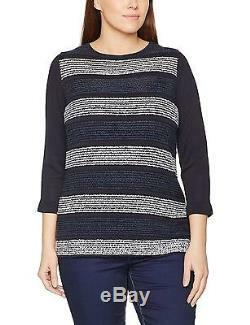 The item "Persona by Marina Rinaldi Women's Allegro Long Sleeve Top Blue (Blu Navy) New" is in sale since Tuesday, March 14, 2017. This item is in the category "Clothes, Shoes & Accessories\Women's Clothing\Tops & Shirts". The seller is "ssb-direct" and is located in GB. This item can be shipped to United Kingdom, AG, to Austria, to Belgium, BG, HR, CY, CZ, DK, EE, FI, to France, to Germany, GR, HU, to Ireland, to Italy, LV, LT, LU, MT, to Netherlands, PL, PT, RO, SK, SI, to Spain, SE, to Australia, to United States, RU, to Canada, BR, to Japan, to New Zealand, to China, IL, to Hong Kong, NO, ID, MY, to Mexico, SG, KR, to Switzerland, to Taiwan, TH, BD, BZ, BM, BO, BB, BN, KY, DM, EC, EG, GG, GI, GP, GD, GF, IS, JE, JO, KH, KN, LC, LI, LK, MO, MC, MV, MS, MQ, NI, OM, PK, PE, PY, RE, TC, AW, SA, ZA, AE, UA, CL.